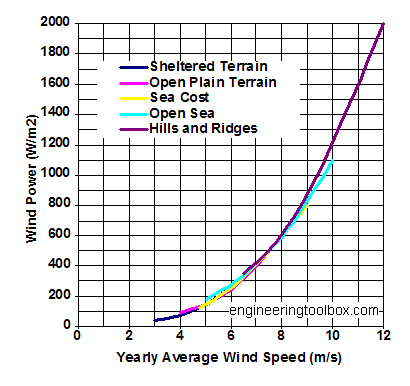 Available wind resources as a function of yearly average wind velocity and different typical terrains are indicated in the diagram below. The resources refer to the power present in the wind at level 50 m. Be aware that wind turbine efficiency is typical 20-30%. Engineering ToolBox, (2008). Wind Energy. [online] Available at: https://www.engineeringtoolbox.com/wind-energy-d_1216.html [Accessed Day Mo. Year].